Words that have the same adjective and adverb form can be confusing for students (e.g., I bit the hard cheese [adj], I studied hard [adv]). But what about when the adverb then has two forms, such as hard and hardly? These tricky adverbs have different forms depending on the sentence position and/or meaning. Devoting a lesson to these adverbs is a great idea—it will cause less confusion when students come across them and will give students a chance to practice them. 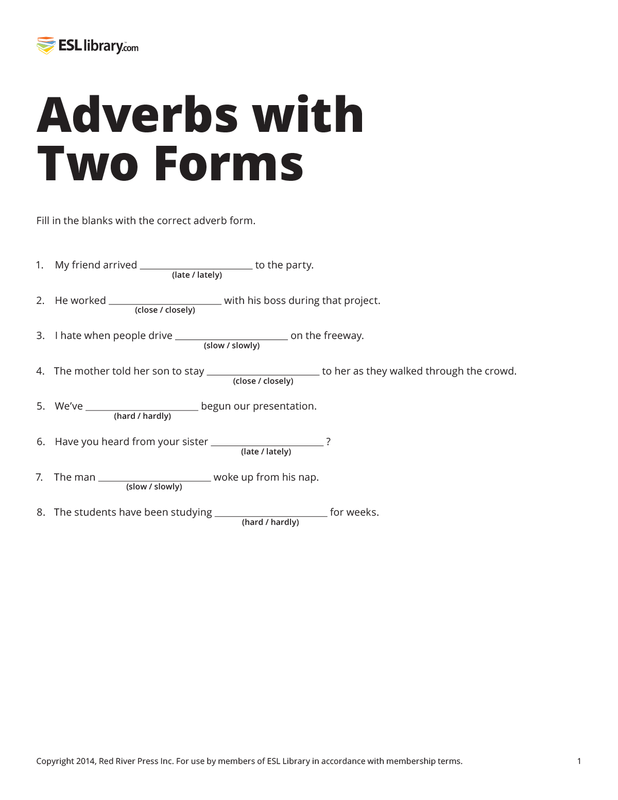 Read on for an analysis of four of the most common adverbs with two forms, and get your students to try the practice exercise at the end to test what you’ve taught them. Meaning: Near in space or time. Note that closely can often be used in place of close. Example: Don’t drive so close to the car in front of you. Meaning: Near in space or time. Position: Before or after a verb. Point out to students that before a verb, only closely can be used (never close). Example: They are closely related. / She worked closely with me on the project. Meaning: With a lot of effort. Example: You’ll have to work hard if you want to impress your boss. Meaning: Almost not at all. Position: Before a verb or at the beginning of a sentence. Example: I hardly got any work done with all the noise. / Hardly anyone showed up for my party. Meaning: After an expected time. Example: I slept late again, so I’m going to get in trouble with my teacher. Position: At the beginning or end of a sentence. Example: Lately, I’ve been worried about my future. / I’ve been worried about my future lately. Meaning: The opposite of fast. Some people object to slow being used as an adverb, but it has been in use for over four centuries, according to Merriam-Webster’s Dictionary. Note that slowly can usually be used in place of slow, but it is more common to use slow after verbs of movement. Position: After verbs of movement. Example: Go slow so that you don’t slip on the ice. Meaning: The opposite of fast. Position: Before or after a verb. Point out to students that before a verb, only slowly can be used (never slow). Examples: She slowly stood up to give her presentation. / She walked slowly to the front of the room. My friend arrived late to the party. He worked closely with his boss during that project. I hate when people drive slow (or slowly) on the freeway. The mother told her son to stay close to her as they walked through the crowd. We’ve hardly begun our presentation. The man slowly woke up from his nap. The students have been studying hard for weeks. Can your students guess which adverbs belong in the following famous quote? Can they explain the meaning? Other adverbs with two forms that you may wish to explore with your students include: fair/fairly, fine/finely, free/freely, high/highly, just/justly, most/mostly, near/nearly, pretty/prettily, right/rightly, sharp/sharply, well/goodly, wide/widely, and wrong/wrongly. For more tips about adverbs, see my post on the 7 Adverb Patterns.